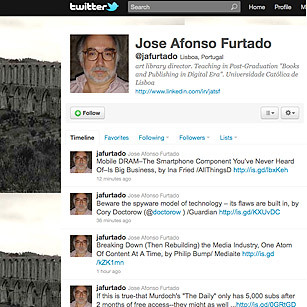 Sample tweet: "Flipback book debuts in Europe: New way to read dead trees,by Chris Meadows /TeleRead http://is.gd/YuLYfm"
José Afonso Furtado is the Borges of Twitter, a Portuguese librarian who brings his unadulterated love for all things books and publishing-related to the Twittersphere. Based in Lisbon, Furtado has a day job as the art-library director of the Calouste Gulbenkian Foundation, but manages to create a running feed of timely, must-read publishing-industry news. And luckily for followers, Furtado has a liberal definition of the word publishing: stories on everything from Google securing patents for its doodles to highlights from the latest literary awards. And while he's clearly comfortable tweeting in English, you'll forgive him if he slips in a tweet every now again in a language that requires the use of accents. See the top 10 Twitter moments of 2010.